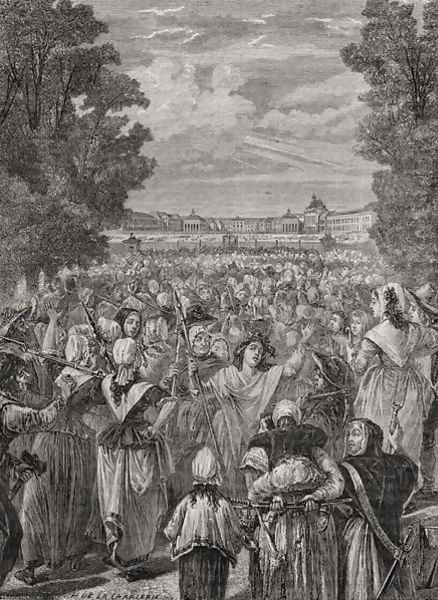 On this day in 1789, an angry mob of nearly 7,000 working women – armed with pitchforks, pikes and muskets – marched in the rain from Paris to Versailles in what was to be a pivotal event in the intensifying French Revolution. To the beat of a drum, the women chanted “Bread! Bread!” – for, despite the fertile French soil, the populace of Paris was starving while the remote Louis XVI and the much-hated Marie Antoinette continued to feast like proverbial kings and queens at their salubrious country gaffe. The Revolution had begun two months earlier, but neither the Storming of the Bastille, the “Great Fear”, the August Decrees or the “Declaration of the Rights of Man and the Citizen” had thus far managed to topple France’s seemingly intrinsic Ancien Régime. But the women who set out to Versailles to demand bread were about to change all that, and the very course of modern history. By the time the women reached Versailles, their rage was focussed almost solely on Marie Antoinette – whose misattributed response to the plight of the breadless and starving peasants, “let them eat cake”, was nevertheless a wholly accurate indication of her cluelessness. 20,000 French National Guardsmen had been dispatched to protect the royal family, but the mob still managed to break into the palace to search for the Queen – who only narrowly escaped by fleeing to the King’s secure apartments through a secret passageway. Two of her bodyguards were not so lucky; their severed heads impaled on pikes served as a clear statement of the mob’s intent. The women then assembled in the palace courtyard and demanded to see the Queen. She eventually emerged, along with her two children whom she cunningly used as a human shield – but the crowd demanded the Queen face them alone. For ten excruciating minutes, Marie Antoinette stood on the balcony with her head bowed while the angry throng below screamed and pointed their muskets at her. Remarkably, they did not kill her. Instead, something far more unlikely happened: the masses recognised their own strength against the mighty monarchy. The women thenceforth demanded that King Louis XVI distribute the bread that the palace had hoarded, sanction the August Decrees and the Declaration of the Rights of Man and of the Citizen, and accompany them back to Paris to see for himself the plight of his subjects. The King had no choice but to agree to the terms. The next day, Louis and Marie Antoinette became prisoners of the Third Estate, or the “common people”, until their respective executions in 1791. This entry was posted in Heroines, Revolution. Bookmark the permalink. But who co-lead the historic? This is so helpful for my social studies project. Same Im literally pulling an all nighter rn and this saved me. This is a very good resource for my history fair project. i recommend it highly! Fantastic stuff! Thank you for this information – how fascinating – and terrible – the French Revolution was. I just thought I would point out that King Louis XVI was not executed in 1791, but on the 21st January 1793, and Marie Antoinette was executed on the 16th October at the end of the year. It is amazing how the misconceptions of history pass down uncontested. Marie Antoinette was “clueless”, yes, but, unfortunately, that was her job. She was not a part of the government, and she had not been raised to be anything other than an adornment (& worse, an unwitting Austrian spy, which, thankfully, didn’t really pan out). And yet, due to her personality (her love of beauty and fashion, as well as her overwhelming disdain for court formality, both of which put her at the front of Society’s consciousness), she became the symbol for everything that was wrong with France. And while this may have been correct, it was not nearly as much her fault as people back then, or even people today, want to believe. Even had she been entirely cognizant of the dreadful conditions of the average person, any attempts on her part to ameliorate them would have been considered even more scandalous than her frivolous behavior, and she would been ignored at best, or ridiculed, by those who would be expected to make the changes. You could argue similarly about any pre-revolution monarch. lmao even on educational sites no one is free from hate. Power to the people! They stood up for what they knew was right, even when it was believed for it to not be their place to fight, They stood up and fought! Lets go ladies! There are no spelling errors, anonymous. Let me guess… you’re American, right? Are you not aware that UK English uses an ‘s’ rather than a ‘z’? The Spice Girls (or whoever is the latest girl band etc) have nothing on this kind of “GIRL POWER”! good matter on the topicThe Women’s March on Versailles. From what I’ve read of Marie Antoinette, she loved her children very much. Did she really use them as a human shield? In addition, when Marie Antoinette bowed to the crowd, they began yelling “long live the queen!” Mobs never did make any sense 🙂 Anyway, just thought I’d throw that in there. Thanks for the cool info! I long for the day when the same thing happens here (although,probably knowing typical British political apathy), the Monarchy will one day simply ‘fizzle out’ due to pure boredom and disinterest on the part of society- anytime in the next 5oo years, people! I get the same comment to this entry again and again: “Marie Antoinette NEVER SAID ‘let them eat cake'”. Read the entry more carefully, people. I acknowledge it was MISATTRIBUTED (use a dictionary if you don’t know what that means). yeah that’s exactly true cuz marie antoinette never said “let them eat cake.” get it, Dorian???????????????????????????????????? Polite suggestion: look up “misattributed”. who is the author of this article, please? Greate peças . Manter escrevendo tal tipo de informação em seu blog . Estou realmente impressionado por -. emprego. Eu vou definitivamente digg- e por minha parte recomendo aos meus amigos. Eu sou confiante irão ser beneficiado com este local . This website was very helpful, and made it ten times easier to write my essay. That is acknowledged in the piece. pulling an all-nighter right now because my world history honors 4-page essay is due tomorrow and this site just helped immensely.